Get ready to play more with EA Access! Tons of amazing games, exclusive early trials and sweet discounts are all yours when you join. • Dive into a massive collection of great EA games as much as you want, whenever you want. Play blockbuster series like Battlefield, FIFA, Need for Speed and more! Titles are added regularly, so your game time never has to end. • Try new EA games days before launch with exclusive Play First Trials. Your save progress carries over to the full game if you decide to buy. Plus, trials stay active long after release day, so you can find out what all the hype is about anytime. 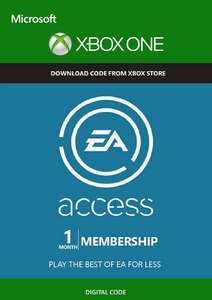 • Automatically save 10% on EA digital purchases on Xbox One like full games, DLC, Ultimate Team content and more. Want that brand new DLC for a game in the collection? Just finished a Play First Trial and want the full game? We’ve got you covered. Ready to play the best of EA? Sign up now. Cancel at any time. I must say - I bought the £20 a year and I've hardly been on it seems a bit of a waste. Do you know how long the codes stay valid for? I think my sub is coming to an end soon - I might grab a couple of these …I think my sub is coming to an end soon - I might grab a couple of these for when certain titles get added... (highfive)Do you know how long the codes stay valid for? Would you like a code mate? Anyone got a 3 day trial they dont want, usually comes with ea games for free. I used the code given on the link but it didn't work for me this time (usually does). Dunno if you've been successful with this item... Could be my account. What games are available with ea access atm? I got the email almost immediately (containing a link to the code) - have you checked your junk folder? I got the email almost immediately (containing a link to the code) - have …I got the email almost immediately (containing a link to the code) - have you checked your junk folder? For Apex players, you get a 1000 coins for free plus a weapon skin for having EA Access. The season 1 battlepass coming soon will cost 950 coins.